Time for more linky love! Wait. Before I get going, I have to tell you that the only reason I even started reading this blog was based solely on the name of the site. I have a friend who goes by the name of "Mudpuppet," and it has always made me giggle....so when I heard that I should I always listen to my *Pig*Puppet, I immediately linked to it. I never did show my friend, but I've been reading it ever since. Anywho, she recently posted about thought bubble haircilps and I found them quirky-worthy. There are several of them here so check 'em out yourself to find some that suit you. 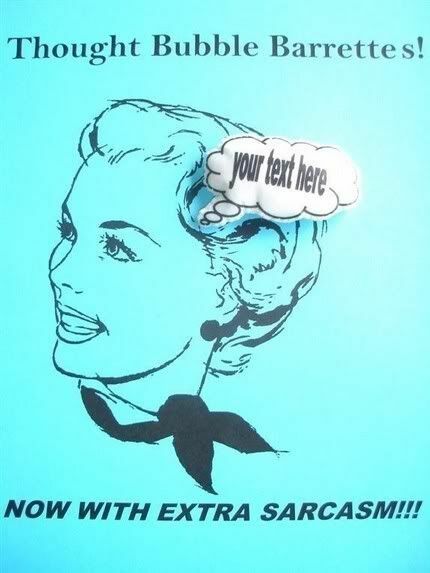 I like the "I'm such a nerd" thought-bubble barrette! And for only $4 bucks, I might just have to sport one. I've been tagged for another meme and thought I'd tag you now. Don't worry, it's kind of fun. Ha! Too funny! Thanks for coming by and entering - I hope you have an incredible start to 2008!